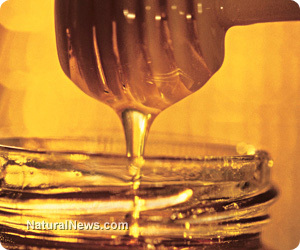 (NaturalNews) As a healing and nutrient-dense food, many of us are familiar with the benefits of raw honey. But did you know that honey can be used in a variety of ways outside the kitchen? If we only use honey for its sweet taste and glorious texture, we miss out on an entire spectrum of applications. Granted, a batch of local, organic and unpasteurized (raw) honey offers a wealth of nutritional perks, including minerals like iron, calcium, potassium and magnesium -- not to mention easily digestible simple sugars, which can give you a healthy boost when energy lags. Nevertheless, honey is much more than just a delicious food. Have a look at the following eight alternative uses for this "liquid gold." Sanitize scrapes and cuts, soothe burns -- As a naturally antimicrobial substance, honey acts like an antibiotic cream. In fact, research published in this article found honey to possess superior antiseptic and healing properties. And manuka (the "King of Honey") has even been shown to knockout antibiotic-resistant MSRA bacteria. Quiet a cough, ease sore throats -- As shown by clinical studies, honey has equal effectiveness in calming coughs as over-the-counter cough medicines. Mix 1 tablespoon or so of raw honey with warm water to tame a sore or dry throat and soothe nagging coughs. Banish parasites -- Known as a backpacker's remedy for parasitic hitchhikers, a blend of honey, purified water and apple cider vinegar will help destroy the intruders. Mix 1 tablespoon each of honey and unpasteurized apple cider vinegar with 2 cups warm water. Drink several times a day for two months. Relieve the agony of a hangover -- If you find that you have overindulged, try a teaspoon of honey dissolved in a glass of water to help speed up the metabolism of alcohol. Moisturize -- As a humectant, honey naturally draws moisture to the skin, making it an ideal addition to any anti-aging regimen. To make your own herb-infused honey lotion, Anna Brones of EcoSalon offers an ingeniously simple recipe. Shine -- For beautiful hair, mix 1 teaspoon of honey with 1 quart of warm water -- use as a final rinse on just shampooed hair. The result? Those frizzy, parched locks are a thing of the past, and unruly hair is given a glossy finish. Calm anxiety -- Long used in Ayurvedic medicine to quell nervous disorders, honey is especially effective when combined with calming teas like chamomile, fennel or lavender. Conquer insomnia -- If stress hormones are keeping you from getting decent shut-eye, take a teaspoon of lightly salted honey before bedtime. A small amount of honey in the evening ensures that glycogen stores are adequate in the liver, which reduces the release of sleep-disrupting hormones. For more ideas on how to use honey beyond the kitchen, the Mother Nature Network provides further inspiration here.